This makes an appearance at the reservoir every year. 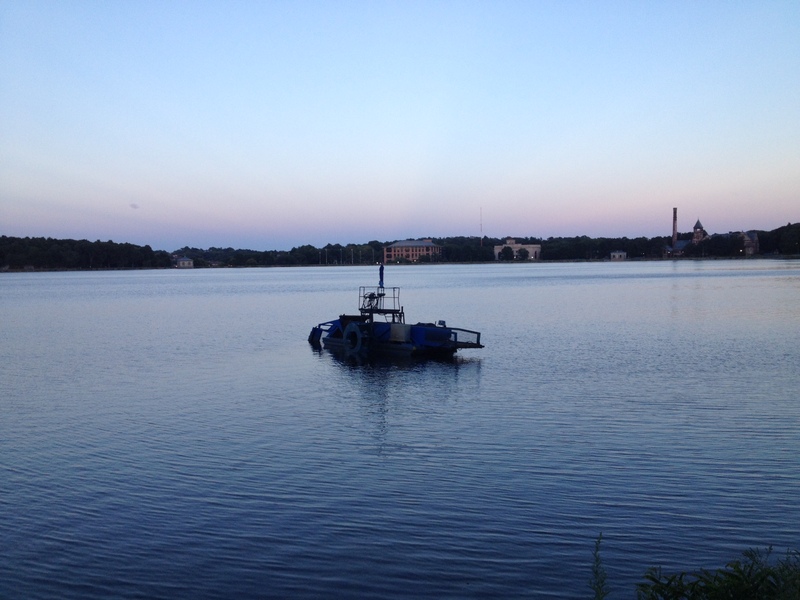 Is it a dredger? Or, the way I used to be, but no more!! Four years ago, I paid out about $3K per month and that was before I had eaten. How, you ask? Well, $1250 for rent, $900 for my half of a mortgage payment, and $900 in student loan payments. Yep, that’s a whole lot of cash going out the door. It left me with about $500 for the month, and that was to cover food, utilities (I mean, CABLE was a must!! ), car repairs, etc. Not to mention that I was also fighting through the stages of unmedicated clinical depression, and add in the turmoil of a marital split after 11 years together, and you don’t get a frugal person. You get someone who doesn’t want to sit home because then that forces you to sit with your thoughts. And who wants to do that when all you feel is guilt, a heavy heart and lots and lots of self doubt? No, you want to go out and shop. First “emergency?” The TV which my ex said I could take – well, not sure if it was broken before it got moved or if it just died on the way, but it didn’t work. Now you can imagine my horror – what to do?? I had to have a TV. I HAD TO! So, yep, out came the credit card. Thank you, Best Buy, for putting that 22 inch TV on sale for under $200. Well, luckily for me, after a few months, my ex was able to refinance the house on his own account and that saved me $900/month. A little bit more breathing room. Yet my credit card balance seemed to keep on climbing. My apartment was huge and I felt I “needed” all that space that it gave me (1,000 sq feet), because it was me and all of two cats. They needed all that space. At one point, I thought to myself, enough if enough, and I was going to pay off my credit card. After all, I would pay something like $300 on it every month but then by the end of the month, I needed to use it because of my less than stellar budgeting skills. So I’d charge something and then the net get-ahead figure was down to around $100. At this rate, it would take forever to pay off. So, still having a really good credit score, I got myself another credit card with one of those introductory rates of 0%. I fully had the intention to transfer the balance and pay it all off. As you can imagine, that wasn’t the case, and before I knew it, the introductory rate was coming to a close, and there was no way I could pay it off by then. So instead of paying 13% in interest rates, I took money out of my own 403(b) account, and was paying an interest rate for about 5%. Sound like a deal, doesn’t it?? Well, I suppose so if you don’t count in the fact that I was stealing from myself in that that money could have been making more money for me down the line. I don’t know why but it took me having to borrow money from my own future, something I had been told to never do, to get me to wake up and realize what I was doing. Maybe it was that, or the fact that one Christmas vacation, I knew I had about $10 to spend. My best friend asked if I wanted to go see a movie, and I had to come up with an excuse as to why I couldn’t go, when I didn’t have to work the entire week. My one credit card I had remaining was maxed out, and I knew they wouldn’t raise the limit (I asked, and was told that it was “doubtful” I would be able to pay it off if the credit was raised.) I was lucky if I had maybe $500 set aside in savings. Total. It had taken me just two years or so to get to that point from the phone call I had had in 2010 when the bank representative was so sure I could pay it off every month. I remember thinking “I’m 39, and this is what I’m living like? ?” This has got to be the lowest of the low. I finally just said ENOUGH is REALLY ENOUGH!!!!!!!!! Flash forward to today. I have money in savings and and *almost* putting as much into savings every month as I live on, out of my take home pay. That makes me feel damn good. I even considered paying off my LAL student loan in full, but knew it would leave me with pretty much nothing in an emergency fund and the thought of that kind of scares me. So I’m still banking what I can and will likely take a chunk of it at one point and make some big headway on that goal. I still want it paid off by next June, come hell or high water! I still sometimes end the day before a paycheck with $10 to my name in my checking account but lately it’s because I have refused to take money out of savings to tide me over. 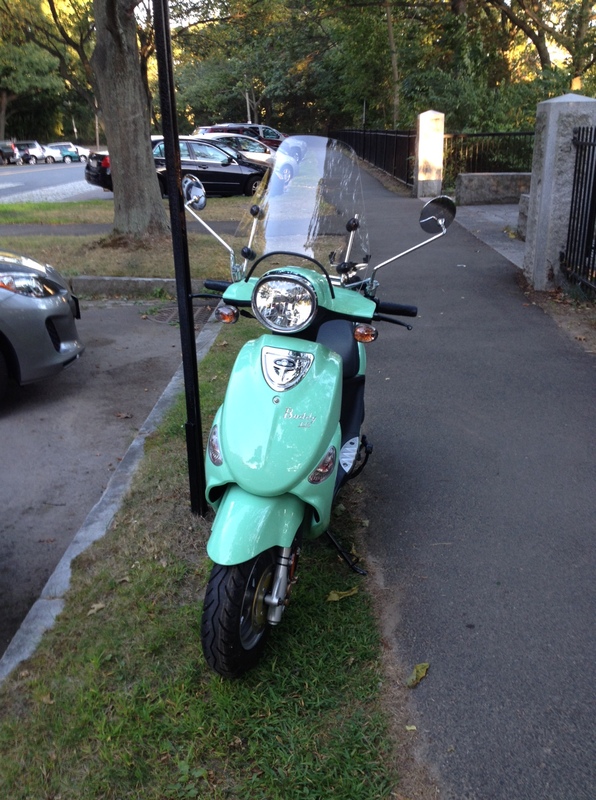 Yes, I did buy the scooter this past weekend and had them put $3000 on my debit card (seriously, I think the most ever). And while I did have them put $564 onto my paypal credit line, it’s only because it takes two days to transfer money from my online bank account to my brick and mortar one. It will be paid off this week, and then I think I will probably close it (unless, would that kill my credit? I have no idea, but if you know the answer, please let me know.) I just really don’t like having an open line of credit. I know my history. And wow, this post has become sooo long! I will write more later about how I have been biting the bullet when it comes to spending and how I’ve been motivating myself to NOT do it like I used to. If you’ve stuck with me this far, bless you, and have a great Labor Day holiday! And as always, if you have liked this post, please hit like or subscribe, or leave me a comment below! And you can join me on facebook if you so choose! Thinking of naming her CeCe (really “C.C.”) for two of my cats who crossed over the rainbow bridge: Clara and Chloe. You have really learned a great deal about financing. Your doing great, I know you’ll have the MH you want, when your ready. Thank you, Roger! And now I’m off to look and dream by looking at rvtrader and craigslist! Girl, you are killing it! It’s hard to imagine what we can do when we say to ourselves, “Enough is enough! !” This debt thing is such a burden but you are killing this giant each day. I can’t wait for the day when I’m completely debt free. Your post is very inspiring to me and I’m sure to other readers. Thank you, Kelvin. Btw, you might want to check out this website called The Empowered Dollar, about this girl who was living on minimum wage, then got another higher paying job, but has since left that job to work on her own. She paid off $30K in student loan debt in four years. And she went to BU, where I used to work! She is inspiring too. I hope to really kill this giant by next June, still. You were pretty much living the American dream….or…uhm….nightmare, but at least you are doing something about it, and making great strides to conquer your debt. I guess I was lucky when I was growing up that my parents hammered into my brain: “If you can’t pay cash for it, you don’t need it” Great post Terri !! That was my grandma’s philosophy. I think with my mom, having grown up a baby boomer, and child of parents who had been through the depression (and my grandfather was an immigrant who came with pretty much nothing but then later achieved his dream of having a lunch counter type place), when she did have money, she liked to spend it, on things for us, etc. I don’t think she completely understands the new way I want to live, but she seems to be going along to get along, if you know what I mean. And maybe realizing that some of us do have different takes on what makes us happy in this life. Thank you – I’m glad you liked the post! I’m going to try riding it again tonight. Wish me luck. And I certainly hope you are right, that the tide is turning. Even if it’s not, we know we are going in the right direction for US. Thank you, Jodee…I am beginning to rethink the scooter, though, I have to admit. I feel it in my gut that I am scared to death on it, even though everyone keeps telling me to give it time. Oh, I remember the feeling of paying off my credit cards. I even had a friend take a picture of me cutting them up in my office here at work. It was the BEST feeling! That’s also good to have no car payments. Sorry, I see you’ve already taken the motorcycle class. Yep, and the instructor is going to get together with me one night next week to practice and see how I am doing. Wow that’s great Terri, I’ve never heard of an instructor getting with a student after a class is over. Very cool! He’s an older gentleman and going through a rough patch right now (recent split with wife of many years) so he’s helping me out as a friend. He knows I know what he is going through, from personal experience. Thank you for leaving a comment! Yes, the debt really does crimp the lifestyle, but it’s been just like another part of my budget to me. At least the Big Daddy loan part is… I find that the more I look forward to just living in an RV, the easier it is for me to say “no” to things. As in, will it fit in the the RV? If the answer is no (which it usually is), then I don’t buy it!